On this overcast Sunday, one of the things I wanted to do was laundry. I am okay. I have enough clothing but it never hurts to do a load to stay on top of it. There is, however, a 17 pound impediment. 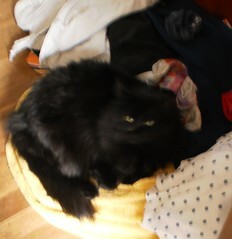 Since I returned from Connecticut and let her sleep on the clothes pulled from my suitcase, she's been doing that with the every day dirty clothes. I have a laundry chute and I usually toss everything down the chute. But I let a small pile develop and, the next thing I know, it's her nest. If St. Francis cut the arm off his robe so as not to disturb a sleeping cat, how can I toss all the clothes down the chute, except, of course, if I were to have someone pay me a visit? I think some of this is because it has my scent on it and that is comforting. I think another part is that it's warm where the clothes are. That part of the floor is near the furnace and there are a number of pipes for heat running under this section. Another thing is that the pile is in my home office and this puts her close to me. She can monitor my comings and goings and she doesn't have to move. Whatever the cat reasoning is, it's fine with me. I know exactly where she is, can reach down and provide ear scratches when I go get more tea and she's happy. 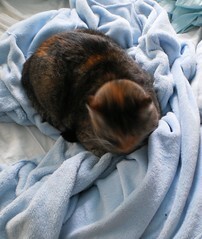 Mija, on the other hand, prefers to sleep on my bathrobe. This is fine, until morning when I want to wear it. Well, I think I want to wear it. Maybe I can do without it.